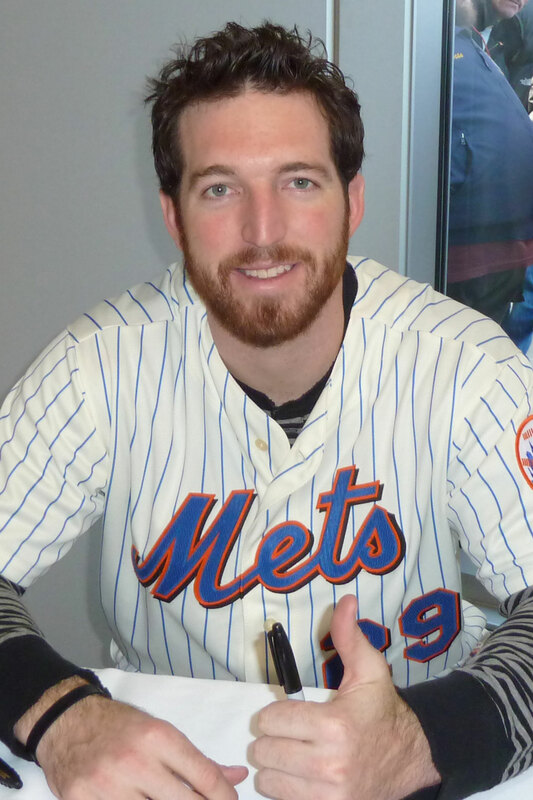 Will Ike Davis be on the move again this winter? Former Mets first baseman Ike Davis is likely to be the subject of trade rumors again this winter, according to Daily News baseball columnist Andy Martino. While Pittsburgh GM Neal Huntington publicly maintains that the team sees Pedro Alvarez as a third baseman, many believe the Pirates will move him to first base because of a throwing problem he developed this season. And that makes Davis expendable. After being acquired from the Mets in April, Davis, 27, hit .235 with a .343 on-base percentage, 10 home runs and 46 RBI. Davis earned $3.5 million this season and should expect some kind of raise through arbitration, so it’s possible that Pittsburgh will simply non-tender him. He could still be attractive to a team looking for a platoon player, and Martino mentions the Miami Marlins as one possible destination. I’m not sure how I feel about seeing Davis play in the National League East again… while he didn’t do much against his former team this season (2-for-18, one run scored, two RBI), I’m afraid it might not continue to work out that way if he plays on a team that faces the Mets 18 or 19 times a season. As a Mets fan, I’m excited about the young pitchers who are coming up through the minor league system. But sometimes, it’s good to remember that just about every team has its own highly-regarded pitching prospects. Nick Kingham, who was just promoted to Triple-A a couple of weeks ago, could be part of the Pittsburgh Pirates rotation in 2015. In pre-season rankings, Kingham was regarded as the third-best pitching prospect in the Pirates’ system, behind Jameson Taillon and Tyler Glasnow. Baseball America and Baseball Prospectus both counted him as one of the top 100 prospects in the game going into 2014. 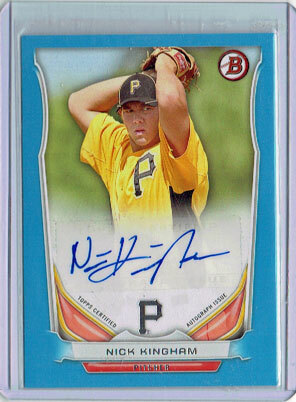 Pittsburgh drafted Kingham out of Sierra Vista High School (Las Vegas, Nevada) in the fourth round in 2010. According to PiratesProspects.com, the 22-year-old right-hander has a mid-90s fastball that occasionally tops out at 97-98 mph, as well as an above-average curveball and changeup. I received this card earlier this week as part of a Twitter contest prize from @seansa91. Friend was a three-time All-Star and received votes for the Cy Young Award in 1958 and the MVP Award in 1955, 1956 and 1958. One particular victory that came during Friend’s Pittsburgh Pirates career is notable in Mets history. Although he started seven Opening Day games in his career, Friend did not draw that assignment in 1964. 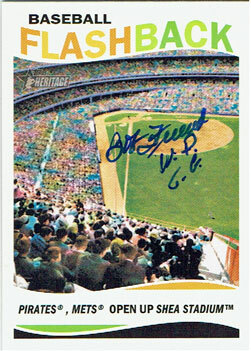 Instead, he pitched the third game of the season – which just happened to be the first official game played at Shea Stadium. As he noted in the inscription on the Baseball Flashback card I sent him, Friend was the winning pitcher in that first game and he notched a complete game – one of 13 he’d throw that season. While the Mets went on to their third straight 100+ loss season, they put up a fight during that stadium opener. After future Hall of Famer Willie Stargell got the first hit at Shea – a solo home run in the second inning – the Mets responded with three runs of their own in the fourth. Pittsburgh responded with single runs in the fifth and seventh innings to tie the game at 3-3, and another future Hall of Famer, Bill Mazeroski, drove in Stargell in the top of the ninth to provide the Pirates’ margin of victory. Two years later, Friend became a Met, where he finished his career. Now 83, Bob Friend appears to enjoy receiving autograph requests through the mail. SportsCollectors.Net has over 600 logged and Friend has returned 98 percent of them, most in about a week.